Can You Install a Barrier Free Shower in Tallahassee FL? Can You Install a Barrier Free Shower in Your Home? Over the last decade, the demand for barrier-free showers has increased dramatically due in large part to the growing popularity of the aging in place concept and using universal design principles throughout the home. At McManus Kitchen & Bath, we believe that no matter what you call it – aging-in-place, ADA compliant, or universal design – it’s really all just good design. The Aging in place concept was developed as a way to allow people to safely stay in their homes as they aged. We prefer the term universal design, as it embraces the entire family, benefiting everyone who lives in the home, not just those with special needs. Put another way: universal design is simply common sense design that accommodates all users and in all stages of their lives. If you’re planning to remodel in Tallahassee, FL, using universal design elements that work for every stage of your life is a smart choice. 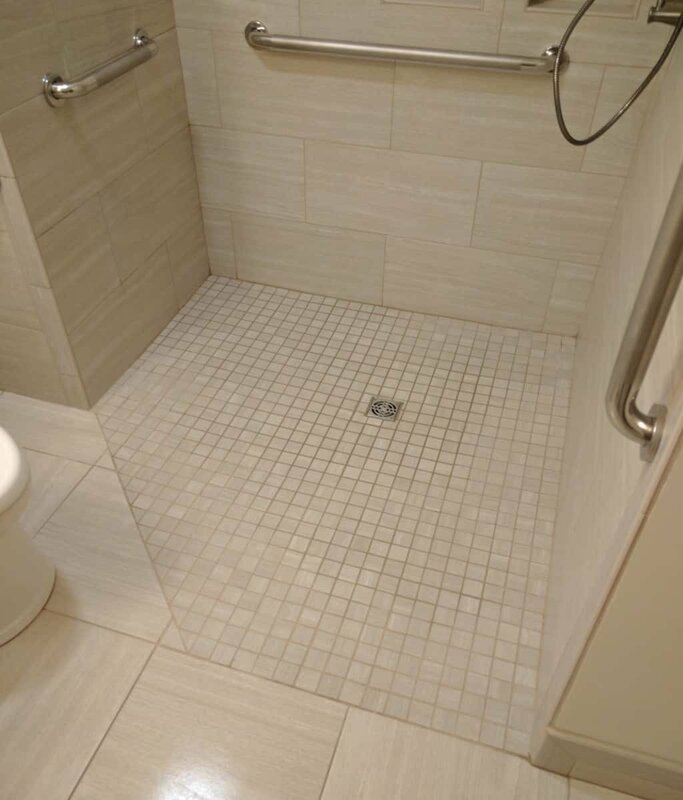 One of the greatest advantages to installing a barrier free shower is it provides easy access for everyone in the home, including those with limited mobility. The absence of curbs and corners also make barrier free showers easier to clean, and seamless floor transitions maximize floor space and make smaller bathrooms appear larger. They look cool. A barrier free shower, especially those with a linear drain create a unique look. Space Saving. In very small bathrooms you can use a barrier free shower to maximize the size of the shower in a small space. Linear drains need to be cleaner regularly. If you use a linear drain in your barrier free shower you need to regularly remove the cover plate and clean it. Most people focus on the curbless shower, but there is a wealth of universal design features for the bathroom that offer solutions that stylishly comply with Americans with Disabilities Act requirements. Grab bars: installed near the shower, tub, and toilet, grab bars offer a stable grip that can be reassuring no matter what your age or ability. Some people decide that now is not the time for universal design grab bars. That’s a personal choice that we respect, but we do put the blocking in for them in every bathroom remodel we do. That way, they’re already in place for future installation. Handles and faucets: lever-style handles are easier to use than twist ones and are especially convenient for kids or someone with limited use of their hands. Shower heads: handheld showers make a world of difference to your daily routine. These versatile shower heads are easy to use whether you’re sitting or standing, and many have pause settings. They’re also great for cleaning the shower stall! At McManus Kitchen & Bath, we use the Schluter system for barrier free showers. The system includes a linear drain and the KERDI line of watertight assembly elements that includes a waterproofing membrane for the shower walls and floor, as well as specialty pieces for inside and outside corners. The linear drain is ADA compliant and allows for the use of large format tiles that seamlessly transition from the bathroom floor into the shower. It is more aesthetically pleasing, but does require a little more maintenance. 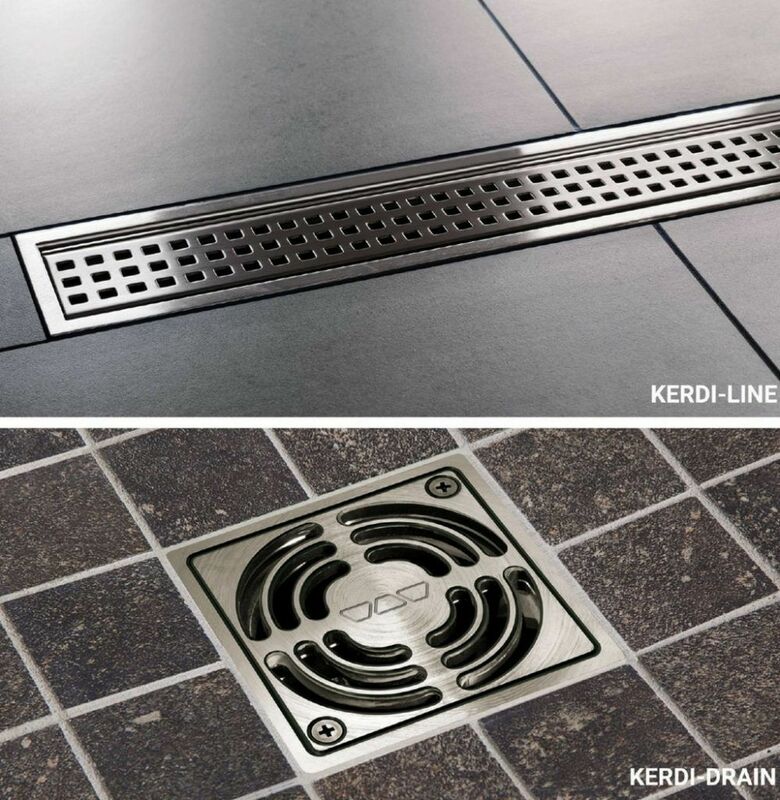 The KERDI-drain is a traditional alternative, but keep in mind that you’ll need to install mosaic tile with this style drain. Ready to get started on a bathroom remodel for your Tallahassee area home? Contact us today and let us show you how universal design can enhance your home’s functionality and increase its value without compromising its beauty. We look forward to meeting with you!